Okay, so here's what happened... I saw my new orthopedic surgeon (didn't get on well with the first) on the fifth of March. Every single day since then, I've thought to myself: "Self, you need to do a hipdate and let everyone know the news." I'd look over at the laptop on the table next to my new home (the recliner in the living room) and think: "Later." There was always a reason--maybe I needed to contribute to Supergirl's daily steps (needed hot packs or more water or medicine), or maybe I was already covered from hip to ankle in hot packs and didn't want to rest the laptop on all that heat, or maybe I needed a nap or any number of other lame excuses. For the past several days, the need to write this post has been mounting and mounting--but I thought I'd do the things I'd been necessarily avoiding (biz stuff like taxes and marketing that I had largely ignored since all this started) first then do this post. You can probably guess what happened... Yeah. I wore myself out doing whatever and then didn't get to the post. Enough of these excuses. On to the Hipdate! If you missed the previous hipdates, I was diagnosed with avascular necrosis of the femoral head sometime between now and January. I was told to go to zero weight bearing or risk dire consequences. Over the course of the seven weeks I was trapped in a wheelchair, the muscles in my left leg decided to hate me. I had severe muscle spasms--and I mean screaming severe. I lost the ability to get in and out of bed safely and had to move to a recliner. I lost the ability to lift my left foot off the ground. Everything activated the muscle spasms--moving, thinking about moving, not moving... You get the picture. It was hell on earth and set a new level ten on the pain scale. Neither Supergirl nor I were getting any sleep...I was alternating taking the muscle relaxers every four hours, so even if everything went well, the most sleep I could get was four hours, and though Supergirl didn't need to be up at those times, she never got much more than I did. Have I mentioned I'm married to superhero? She also took care of RealSig(tm) and kept up with her job. Incredible. The worst part was that for the first week of this torment, I didn't realize it was muscle spasms. It seems that AVN (and I imagine most severe hip issues) can cause something called "referred pain." You don't always feel the pain in your hip, but also in your thigh, glutes, knee, etc. That's what we thought it was until I noticed that a hot pack took me from screaming to almost comfortable in five minutes. I started taking Flexeril that very moment, and it helped, but not enough. My doctor added Baclofen (a potent anti-spasm med used for MS, CP, spinal injuries and the like) to the mix, and along with pain meds and a TENS machine, things slowly evened out. However, I couldn't see how I could survive another six weeks of zero weight bearing if it meant having the spasms. So, we headed to the appointment with the orthopedic surgeon fully expecting to come out of it with a date for my total hip replacement. The surgeon explained things very well for us, however, and listened to our concerns about the spasms, etc. Here's the good news: she cleared me to start recovering from seven weeks of non-weight bearing and sent in an order for aquatherapy to help me get back to full weight bearing over the course of three or four weeks. I was evaluated by the physical therapist a few days later. He had me put my left leg on a scale and my right leg on a box that was the same height, and taught me how to judge thirty percent weight bearing--which is my current limit. I actually walked ten steps with a walker after that. Since then, I've had two sessions of aquatherapy and things are looking up. No horrid muscle spasms, reduced pain, increased flexibility, and...a new friend. His picture is at the top of this post. I call him Johnny (as in Johnny Walker), and despite still needing the chair at times, I've enjoyed long walks (current record is eighty steps) on the beach (well...from my recliner to the bathroom, sometimes taking a detour through the kitchen). My gait is still what the therapist calls a "step-to" gait--I step forward with my left leg and then step to the same position with my right, as opposed to a normal stride of putting one foot in front of the other. I don't care, it feels divine. We are working on getting me sleeping in an actual bed, but because of being in the recliner, the spasms, and the decompensation of my hip flexibility, I can only stand it for an hour or two--but I can get in and out without any issues (just a little pain). We still don't know if I will need the surgery or not. The surgeon explained that it's pretty much up to me--it's a function of the quality of life I have once I get to full weight bearing: how much pain I'm in, what I can and can't do. She said the current state-of-the-art hips are lasting twenty to thirty years, which, given my age, would mean I'd need another surgery later. We are aiming at trying to keep my original parts for as long as possible. Plus, I'll at least have the opportunity to rehab my leg--which will only make the surgery better, even if I have to have it next summer/fall. So, that's it a nutshell. More waiting, but with a better idea of why and what we are trying to accomplish. Plus, greatly reduced anxiety coupled with physical therapy. 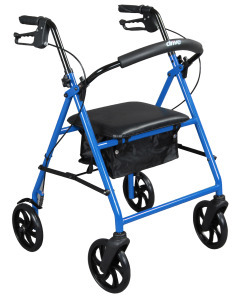 I'm walking more and more each day, and hope to retire the wheelchair this week. Johnny will be around for a few weeks, but I hope to consign him to the closet in the near future (sorry Johnny, it's not me, it's you). I hope to get back to writing in the next few weeks! Hurray!